Money has always been a fascination because of their design and the history they reveal. It is interesting to look at a series of the same denomination and learn the history behind the designs. I had the chance to do that when my bank’s ATM gave me three generations of $20 Federal Reserve Notes (FRN). Although I am not a bank note collector, I find their images and devices interesting. My first impression was the differences in design. 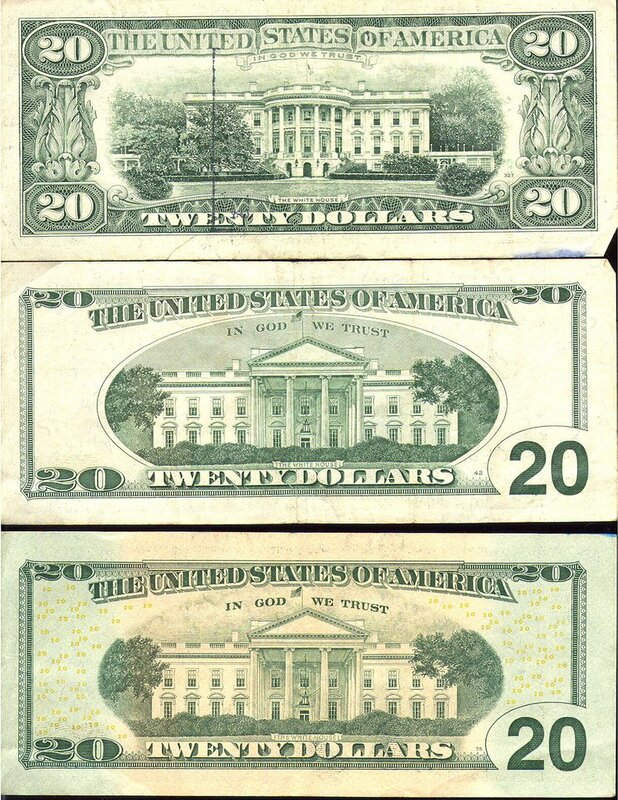 The $20 FRN was first designed in the 1920s and was an evolution of earlier designs. It has ornate and fine engraving with a green hue. The fine engraving has been a staple of bank notes since their inception as a means to prevent counterfeiting. The “green back” was used to prevent copying using new photographic technologies which had a difficult time reproducing the green color. Today, the green color remains out of tradition considering modern imaging capabilities. The newer notes do not have a lot of fine engraving. 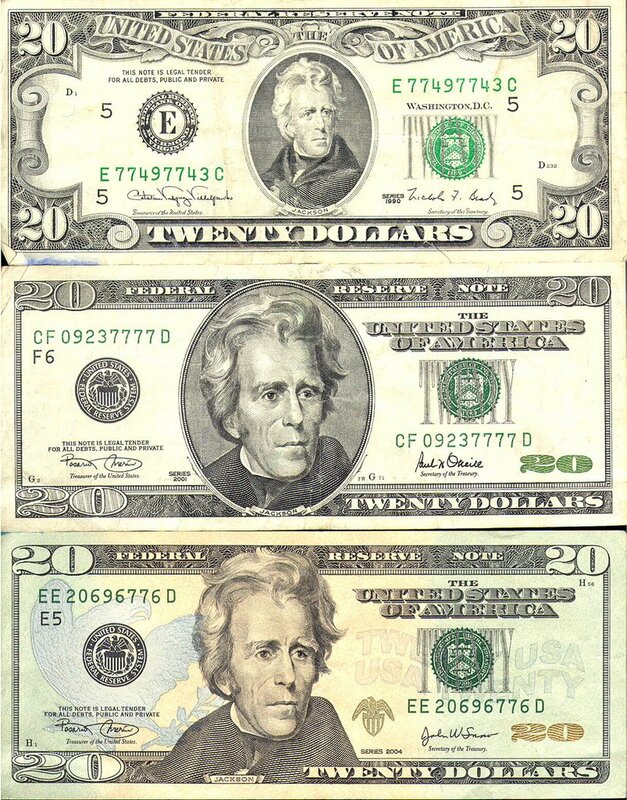 The same portrait of President Andrew Jackson is used but was enlarged on the newer notes with the border around the portrait removed on the Series 2004 notes. Another difference is the addition of color with a darker green hue and peach on the front adds a new dimension I am not sure I like. Although an engraving of the White House remain on the reverse, the older note uses an image taking from the south lawn from the ellipse. The new notes show the White House from the north lawn that could be seen from Pennsylvania Avenue more centered rather than filling the entire reverse. As part of the Bureau Engraving and Printing’s (BEP) program to include better security features, they have left the sides blank so the watermark image and security thread can be easily seen. I like the front of the latest note, but I don’t like the color. I also miss the indication of the Federal Reserve System Bank for which the notes were printed. It is like the mint mark for the FRN. I always found it interesting finding notes from different areas. I like the south lawn portrait better than the one from the north lawn. I am disappointed with the starkness of the reverse. I am not sure that BEP can change this given the nature of the security features. Finally, the attempt to colorize the notes is not working. It looks cheesy. If BEP colorizes the note, it should be more than just a gradient on the background. Many countries use color in their bank notes as part of the devices, not just to splash some color around to say “look at the color.” I think BEP can do better.